You find that our website provides relevant critical information that helps to understand the complex issues of the debt, international financial institutions, or globalisation? You value being informed about alternatives and campaigns that are too often ignored in traditional media? The CADTM website is indeed the result of scrupulous enquiries, of sustained activities and networking among activists and associations, in four languages, it receives 2,300 visits a day. This obviously has a cost. Your support is essential for us to be able to further work on the construction of another world! How can you make a donation ? Please indicate ‘support’ as communication, then by your postal address if your donation is tax deductible (donation over 40 euros per year in the Belgian personal income tax system; more information below). This is the preferred option if you wish to make a one-time donation since it is less costly on our side. Through a standing order for a recurring donation ? However small your recurring donations ensure that our work is done on a long-standing basis. You can use your bank’s online payment system or by passing to them the downloaded standing order form. You can cancel the order, change the amount, and change the regularity of your donation at any time. Please mention that this is a donation. Through the secured Paypal system, using a Master Card or a Visa card. If you wish to get further involved with the CADTM, you can also become a member and/or take an annual subscription to our publications (two magazines and two other publications per annum). A standing order form, along with adhesion and subscription rates may be found here. Why should we call for donation on our website ? 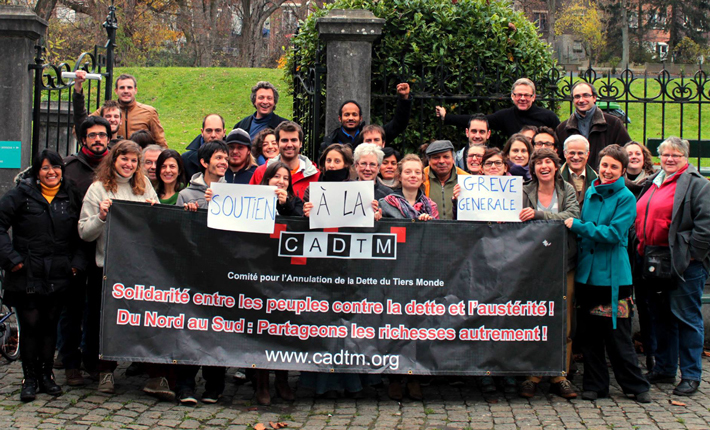 Although CADTM Belgium receives subsidies from public bodies, mainly the Belgian Cooperation for development and the Department for Permanent Education at the Communauté française de Belgique, such subsidies are far from covering the diversity of our activities, the multiplication of training programmes, workshop sessions and various expertises, or the development of the CADTM network all over the world. In the context of debt crisis in the North, of a looming debt crisis in the South, and more generally of a crisis at several levels on a global scale, we think it is essential for us to comfort the work we are engaged in and to weave ever more connections between the North and the South. Your donations make it possible for us to meet our contractual obligations towards our subsidizing bodies (our own capital contribution must attain 20 %), are a guarantee for our independence and the continuation of our work. As an illustration of how our work can be acknowledged, here is what Jean Ziegler, former United Nations Special rapporteur on the right to food, writes in his work L’Empire de la honte (The Empire of Shame): ‘The CADTM has emerged as a real counter-power to the Bretton Woods institutions and the Paris Club Paris Club This group of lender States was founded in 1956 and specializes in dealing with non-payment by developing countries. Yes if you pay your taxes in Belgium. Since 2011 your donations are deductible (45 % on the total amount of your donations) if each of them reaches 40 euros per year. So if you make a donation of, say, 100 euros, you eventually pay 55 euros. We send tax receipts in June of the following year. Together we can build a World that is free from all forms of oppression, socially just and environmentally sustainable.